Giant Bag of Clothes, Part 2 | Barbie Who? Today, we have another entry from the giant bag of clothes. I have been working on the second pair of pants, but my kiddo unraveled most of my progress beyond repair yesterday. This has set me back considerably, as you can imagine. It has also made me reconsider where I place my work, but that is a topic for another day. Instead of keeping the blog quiet, I took some pictures to share from this awesome find while I continue working on the pants. For the uninitiated, I bought a large gallon sized bag of Barbie clothes at a local thrift shop for $5.00. The bag contains over 20 outfits and many additional accessories. I’ve been having fun dressing them up and taking pictures. Here is the second of three posted about it – I have a few more outfits that I will feature in a third post at some unknown point in the future. Without further adieu, here we go! I love the top of this outfit, even though I am not a big fan of miniskirts. Maybe I am just jealous that the doll can pull them off better than I ever could! It is a really cute piece and I like how it has a cute lace belt sewn onto it. The shoes are also from the bag – they’re a pair of pink slip-ons that perfectly match the shirt. 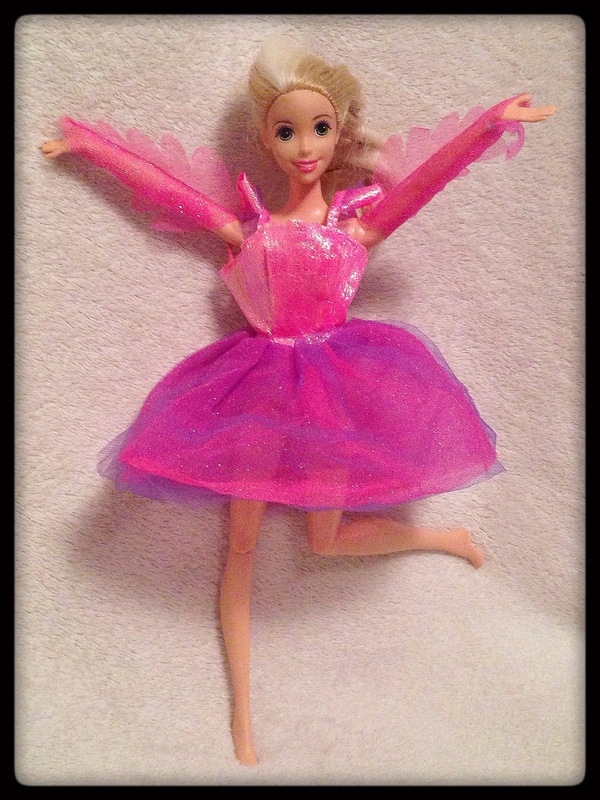 This doll is modern Barbie doll with knee and elbow articulation. I am not sure exactly which doll she is from; I have such a hard time recognizing dolls past the 90’s. Still, a nice doll and a fun outfit. Sparkles! Who doesn’t like a little bit of bling? This outfit is a lot of fun, and it compliments this doll’s hair beautifully. It does have a little rip in the front and some pieces are fraying away, so I will need to do a bit of sewing to fix it. The doll is a modern doll, and once again I am not sure exactly sure about her ID and history. This is another favorite of mine. The swimsuit is actually stretchy and made of spandex like a real swim suit. I thought it would be fitting to dress Barbie #7382 in this swimsuit. It may not be a blue two-piece like the outfit she originally came with, but it is closer to it than the dress I had her in before. I am in the middle of restoring her at the moment, so you can see that her hair is no longer sporting the braid and she has gotten a bath. I think she looks much better now that the layer of grime has been cleaned up – there is a big difference in the face. One interesting thing about restoring this doll is that the permanent marker used to write a price on her foot came right off. The dye from the marker didn’t sink into her plastic body like it does on the vinyl used on modern dolls. Yay! That brightened my day. I may do a blog post later about her restoration, and I have a few idea of how I can turn her into a character for the blog. Alas! That is a topic for another day. For now, this doll is ready for a sunny day at the beach. This is one of the first dresses I saw when I opened the bag. It reminds me of the outfit that Dorothy wore in the Wizard of Oz, although I couldn’t find a similar sized doll that wore this outfit. 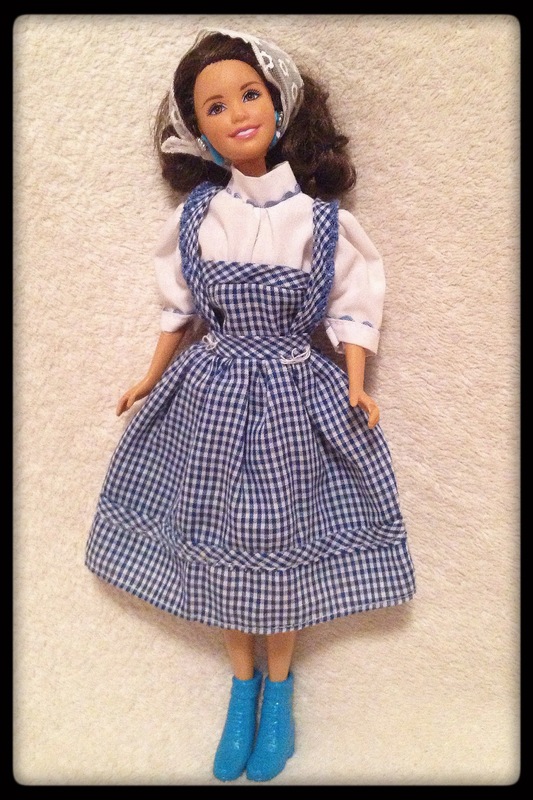 I decided to have the High School Musical Gabriella doll wear the outfit because she reminds me of Dorothy more than any of the other dolls. The outfit is a little large on her, but it isn’t big enough that it falls off. The outfit itself has some loose seams, so I will need to mend it before I let my daughter play with it. She is wearing the second headscarf that came with this bag of clothes. I thought it matched nicely with the overall outfit, so I went for it. The shoes also come from the bag of clothes, and I chose them because they are blue. I know they don’t quite match the dress, and that bothers me now in this picture than it did when I was dressing the doll up. Oh well! This outfit is shiny and reminds me of what ice-skaters wear on the ice. It is very theatrical, so of course the Disney Rapunzel had to strike a pose in it. I am not sure if it is from a Barbie set, but I am very happy it was in the bag. The purple tulle really compliments the hot pin dress, and the sparkly bodice is lovely. I couldn’t find a pair of shoes that fit this doll without falling off. 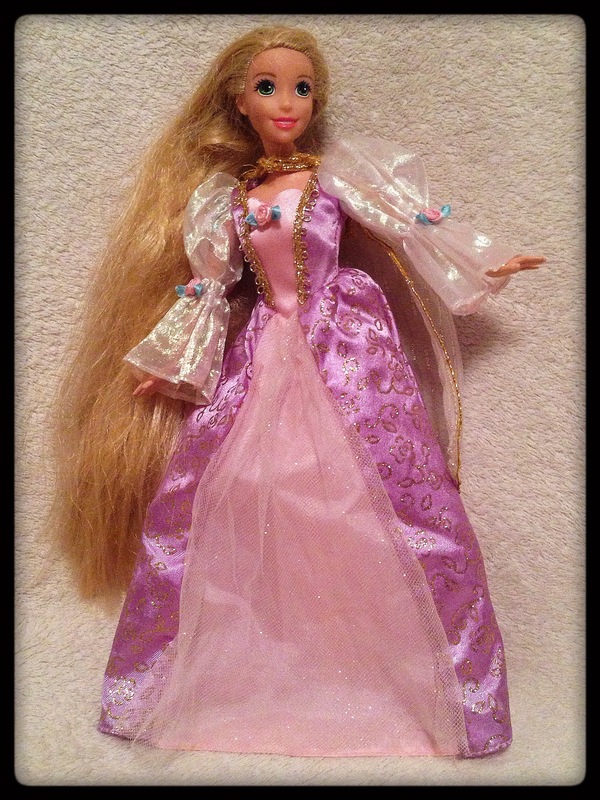 This Rapunzel doll is a bit smaller than a regular Barbie, so the dress is a bit large on her. The doll herself has a white stripe in her hair. I did some research, and this means that she is the Enchanted Hair Rapunzel. The stripe in her hair turns purple when exposed to UV light rays (in her original set, there was a wand that you can use to do the transformation). I left the doll next to the window for 10 minutes and her stripe gained a faint purple hue. What a surprise! I had no idea she did this when I bought her, and I feel it matches the spirit and colors of this outfit. This dress is the main reason why I purchased this bag of clothes. You could clearly see the top of this dress from the outside of the bag, and I wanted something for one of my Rapunzel dolls to wear. My regular Disney Rapunzel doll wears it very well! The dress is from the Barbie as Rapunzel set. Not the collectors set, just the regular set that they sold en mass at retailers. The dress is quite lovely. I need to steam it to get some wrinkles out, but otherwise it is in immaculate condition. It also comes with a cape, which you can kinda see behind her. She is also wearing a pair of pink shoes from the bag, but you can’t see it because it is a full-length skirt. The last doll for today! This is a generic doll in a fun purple outfit. It reminds me of what the tennis team would wear to their matches in high school – our school color was purple. I also chose a jacket from the bag that matches the purple and yellow colors in the outfit well. It was hard to get the jacket on the doll because her arms are less bendable than regular Barbie dolls, but that isn’t uncommon for random generic dolls. She is made of a harder plastic that has less give than the vinyl used for modern Barbie dolls. She is wearing a pair of green shoes from the bag. That is it for now. At the moment, I am restarting the second pair of Ood pants. I am also doing some styling on the two Ood dolls. Realistically, I will probably make a post about cleaning them and doing their hair before I post the entry for the finished pants and the pattern for them. I am very busy as we gear up for Easter (lots of commissions and family gatherings between now and then). That being said, I will carve out as much time for Barbie Who? as I reasonably can. Hopefully I will have something to show for my work by early next week. Until then, I hope you all have a fantastic day.